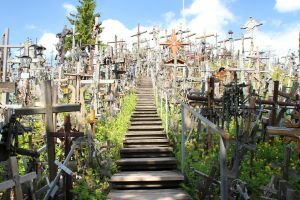 The Hill of Crosses in Lithuania is unlike any other pilgrimage site in the world, a uniquely sacral place revered by people of all different nations and religions. The exact origin of the practice of leaving crosses here is uncertain, but it is believed that the first crosses were left by the family of rebels killed in the November Uprising of 1831. 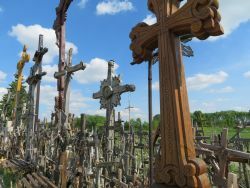 Formed on Jurgaicia mound, considered a holy place, crosses began to appear in great numbers beginning in 1863, after the Tsarist authorities banned the placing of crosses by the roadsides and in cemeteries. Traditionally, relatives of the deceased would place crosses when the remains of their loved ones could not be found, or were buried far from home. Under Soviet rule, the erection of crosses was strictly forbidden – on the night of April 5, 1961, all of the crosses on the hill were bulldozed and pushed downhill, with wooden crosses burned on the spot and metal crosses taken to be melted into scrap. Concrete and stone crosses were destroyed and re-purposed as construction materials. The hill was desecrated four more times after this first devastation, but people continued to bring crosses despite the danger, transforming the Hill of Crosses into a symbol of courage and unshakeable faith. 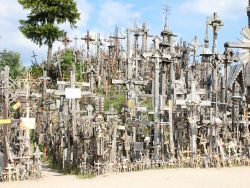 After Lithuanian independence, crowds of pilgrims began bringing so many crosses that they were obliged to leave them at the foot of the hill, with no room left on the hill itself. Pope John Paul II visited the Hill of Crosses on September 7, 1993, praying for Lithuanian martyrs and designating Lithuania as the country of crosses. A Franciscan monastery was built near the hill after the Pope’s visit. The hill currently has over 100,000 crosses of all sizes placed in the ground, as well as a vast number of holy statues, paintings, and rosaries.